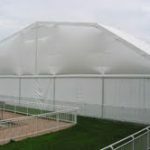 Our Aluminium Framed Fabric Polygon structures provide a temporary or semi permanent solution to your club’s requirements. Quick to installation times and reduced costs allow revenue to be generated all year round by providing dry conditions to teach and to play under. 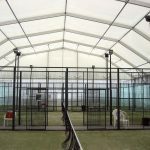 Whether it be for your Tennis, Padel Tennis, Cricket Nets, Football or Multi sports the Polygon Framed structure shape allows greater height at the Apex meeting minimum playing height regulations for Tennis and Padel. 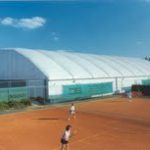 Lightweight, cost efficient and durable to the elements the fabric roofs come in single and double skin options, both providing natural light on court whilst also making cost savings on your energy consumption. 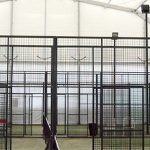 The Polygon Structures provide weather protection and can be upgraded with ancilliary items such as solid wall panelling, roller shutter doors and walkways to existing buildings.